We are just a few short weeks away from opening day of the 2015 HD Expo where we will be exhibiting in booth #2277. We will be debuting several new items including our first foray into wall lighting with our floral wall sconce. You can learn more about this new piece here. We are very excited to hear your comments on this beautiful piece. 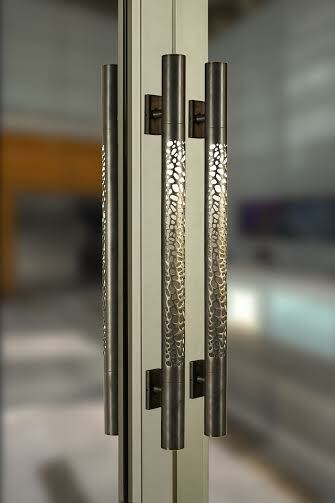 We will also be debuting the new Morphic entry door pull enhanced with LED lighting. Not only does the lighting offer a beacon, of sorts, to the entry of a building but the soft glow is unique and inviting. Plus, additional lighting at the entry of any building is always a good safety tool. And keep in mind that the first ten visitors to our booth will receive one of our orchid knobs. This little gem is sure to add a touch of elegance to a desk drawer or storage cabinet in your home or office. This entry was posted in architectural hardware and tagged 2015 HD Expo, hd expo exhibitor, HD Expo exhibitors. Bookmark the permalink.